With today's focus on bootys and Benjamins in today's mainstream hip-hop, it is increasingly difficult to find artists whose work approaches the level of social consciousness that was so prevalent in the early days of the genre. 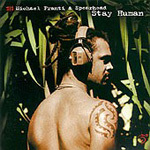 Michael Franti has been on the scene since the mid-'80s, as a member of the progressive Beatnigs and the Disposable Heroes of Hiphoprisy. Since forming Spearhead in 1994, he has produced some of the most insightful and thought- provoking music of the past decade. His newest release, Stay Human, combines a broad sampling of classic soul and funk sounds with a powerful conceptual parable that explores the controversy surrounding the death penalty. It is a stunning and evocative body of work that serves as both a tribute to the musical history of R&amp;B and an effective political statement. Franti is a master of derivation, who uses his vast musical influences in a way that both honors and contemporizes the legacy of his mentors. Vocally, he switches comfortably from a smooth Sly Stone baritone to a sweet and sultry Marvin Gaye croon. His rapping is articulate, intelligent and so at one with the vibe it enhances the story. There's a little bit of everything thrown in, and it consistently works. The slow funky groove of "Do Ya Love"evokes memories of the Philly sound, while "Soulshine" harks back to the glory days in Memphis, when Al Green and his gang at Hi Records ruled the charts. While the music is so good it occasionally masks the story, several short spoken interludes keep the plot moving to a stunning climax. The fictional tale, presented as an underground radio broadcast on the night of the execution of a community activist, includes phone conversations with politicians and the activist. The surprise twist at the end leaves the listener with mixed emotions, and definitely clarifies Franti's stand on the issue. It's refreshing to hear an artist deal with important topics in an honest and creative manner, and Franti definitely makes it work.